Look for this issue with the subtle, easy to overlook green color. It blends right in. This article was a lot of fun to write. My standard operating procedure is to look at some body of psychological research or theory that has nothing to do with video games, and then figure out how to apply it to games. Sometimes it’s a short hop in logic, sometimes it’s an inferential leap that requires a running start. For the psychology of avatars piece, though, I actually got to read up on research that was being done about video games, using video games and similar experiences (e.g., Second Life and virtual reality). There’s a lot of interesting stuff going on in this part of the field right now, and I enjoyed trying to sum up some of it. Researcher Nick Yee started his career by taking the precepts of social identity theory and using them to understand how people behave depending on the virtual avatars they assume. In one of his earliest experiments, Yee had experimental subjects don a wicked head-mounted display that let them perceive and move around in a simple virtual environment. There was just a virtual room, another virtual person controlled by someone else, and a virtual mirror. The mirror was important, because it obviously wasn’t a real mirror and the researcher could use it to show whatever “reflection” of the subjects’ avatars they wanted. In fact, Yee randomly showed subjects one of three types of reflections of their avatar: ugly, normal, and attractive. What the study revealed was how attractive a subject’s avatar was affected how he or she behaved. Relative to those with ugly avatars, people assigned attractive avatars both stood closer to the other person and disclosed more personal details about themselves to this stranger. Then, in a follow-up study using the same setup, Yee found that people using taller avatars were more assertive and confident when they engaged in a simple negotiation exercise. …Like in the real world, we first make an observation about our avatar, infer something about our character, and then continue to act according to our perceived expectations. We needn’t make a conscious decision to do it. As usual, I demand that you possibly consider thinking about buying the magazine if you’re so inclined. 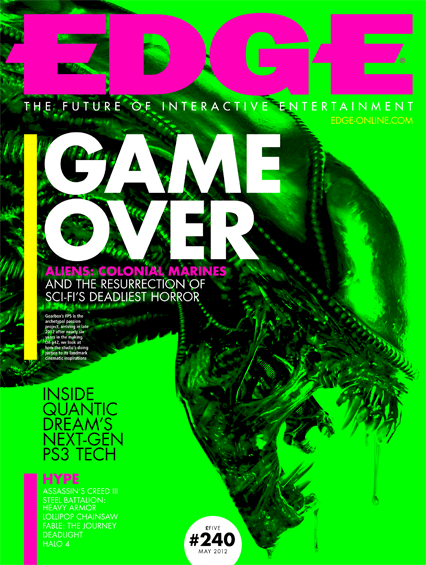 I think it’s an interesting piece and I’m glad that Edge is willing to publish something relatively unusual for the world of games journalism. Also, my favorite thing about writing for Edge, which is a UK based magazine, is seeing that my editor for this article replaced the word “soda” with “fizzy drinks.” That’s absurdly charming for some reason. Very cool! And yeah, if it’s any consolation I paid for my own subscription too.